Giallo Ornamental White Cabinets Backsplash Ideas are ideal for pastel tone addicted personality. Your backsplash won’t be busy at all since you have a beautiful Giallo Ornamental Granite Countertop. In this article, I would like to give the name and the characteristics of the backsplash, the backsplash color and glaze of the white cabinets as much as I can. Giallo Ornamental is from the same family of New Venetian Gold and Santa Cecilia. 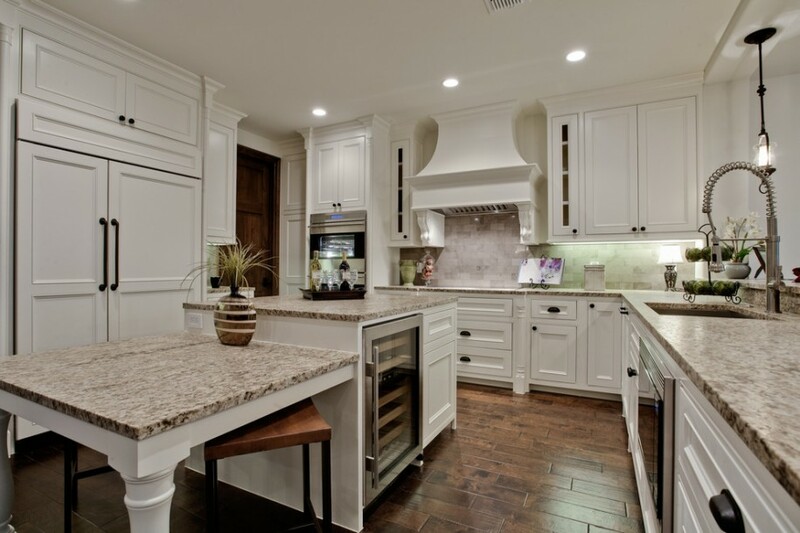 All granite countertops bring some good solution in your kitchen remodeling process. All are very happy to have the white tone cabinets. But I think Giallo Ornamental is one of the best matching granite with plain color little textured backsplash ideas. For golden specs of Giallo Ornamental, I cannot ignore this quote: the more, the merrier. As I mentioned in my Warmth Welcoming: Giallo Ornamental Granite Countertop, the backsplash colors are like white, cream, bone, or light tone earth colors. Backsplash color selection is a piece of cake while white cabinets are picked. The material of the backsplash for Giallo Ornamental White Cabinet Backsplash Ideas can be ceramic, travertine, and marble. The type of the backsplash tile would be subway, mini subway, diagonal and brick. The liners and connections are a very good embellishment in any kind of selection of backsplash. The pictures will give you a large vision in your kitchen remodeling. Giallo Ornamental White Cabinets Backsplash Ideas Pictures for your review. Picture Credit: Bauhaus Custom Homes via Houzz., The excellent work to show the beauty of Giallo Ornamental White Cabinets Backsplash Ideas. RUSCELLO HAND/ LLEMONA by Bella Cera Floors. It is a pre-finished engineered plank flooring, DalTile 3×6 Silver Screened Cross Cut Polished subway tiles, Brushed giallo ornamental countertop,Sherwin Williams dover white colored custom cabinets . Picture Credit: Maillot Homes., Giallo Ornamental Granite’s best companions are Creamy gray natural travertine tumbled subway backsplash, off white cream distressed finished hickory cabinets and , hickory wood flooring with natural clear stain. Abundant natural lights and recess lights make this kitchen more attractive. Just divinely. Picture Credit: Cameo Kitchens Inc., Lovely Giallo Ornamental Granite with Honey Brook custom maple , CS-2101 glazed white cabinets, Bursa Beige tumbled marble subway backsplash and light birch flooring, very elegant looking and warm tones. Picture Credit:Kitchen Design Concepts., Haystack travertine subway backsplash, and tumbled travertine diagonal backsplash ,Giallo Ornamental Granite and white cabinets. Delightful taste in kitchen remodeling ideas. Picture Credit: Accubuilt Construction , Ltd., Giallo Ornamental Granite Countertop with honed ivory travertine brick pattern, hand -scraped engineered hickory hardwood, and antique white cabinets, your dream can be true by having this idea. Please do not forget to share your Giallo Ornamental White Cabinets Backsplash Ideas and post pictures of your kitchen. We can create together a very useful site for curious minds. Thank you for your collaboration.